Moving from ok queens . . . to great queens. Thread: Moving from ok queens . . . to great queens. Re: Moving from ok queens . . . to great queens. But occasionally, from time to time, a few of your grafted cells are as large and robust as swarm cells, correct? That was our aim, and was achieved quite often, but sometimes it's just not going to happen, but you'll still get a good queen. But cells that aren't up to a certain standard, and that is a matter of judgement, they should be culled. With all the feeding you did, was robbing ever a problem? No because they are strong hives. However we didn't take stupid risks that might cause robbing like leaving anything sweet in the open, or whatever. The most important thing for getting great queens is that they are fed well. Raising queens where there is abundant food and in a hive with a high density of bees is the best way to insure this. I'd have to say that this is the largest challenge for me. I don't have much of a problem raising queens when pollen and nectar are coming in. Where it becomes difficult is when there isn't an abundant amount of food. I guess the easiest way to get around this is to ALWAYS have a sugar water feeder going, as well as some type of pollen substitute. Not only while the cells are being drawn out, but a few days or even a week before hand, to ensure really healthy nurse bees. Next is letting them lay for three weeks before you cage or bank them. So letting them lay within the mating nuc for three weeks AFTER they have mated, correct? No because they are strong hives. My question was centered more around the mating nucs than the starter/finishers. 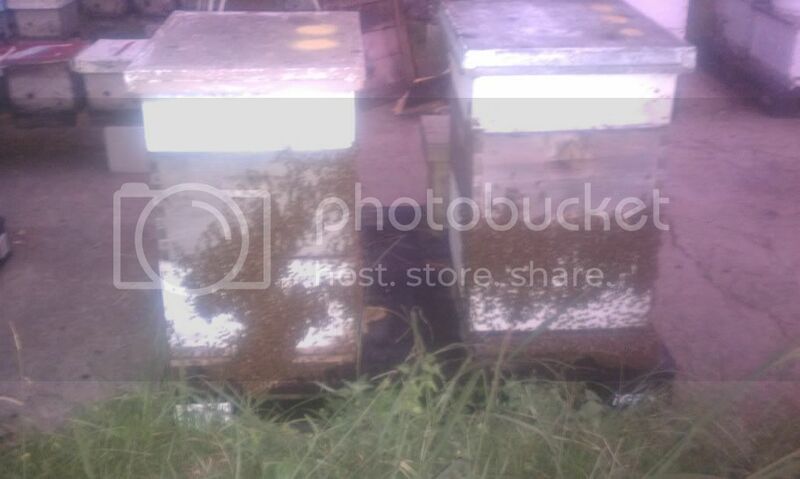 Did you have any robbing issues with smaller, mating nuc hives? I've had almost the exact same experience this year. I've mostly been using a queenless nuc starter/finisher like Joseph does. Although I haven't "I also shake in a few extra pounds of nurse bees I've harvested from several large colonies." didn't know about that step until now. I've also tried using a queenright finisher a couple of times, double grafted, primed with royal jelly that I harvested from 3 day old grafts (very high acceptance), primed with yogurt (rather poor acceptance), primed with 2-1 sugar syrup (works pretty good - probably the best return for the effort) but alas, no monster cells. Some nice queens though, even a few really big ones - once they've been laying a while. So far I favor the queenless nuc starter/finisher - results for me have been at least as good as anything else, and it is so much easier that I graft more often. 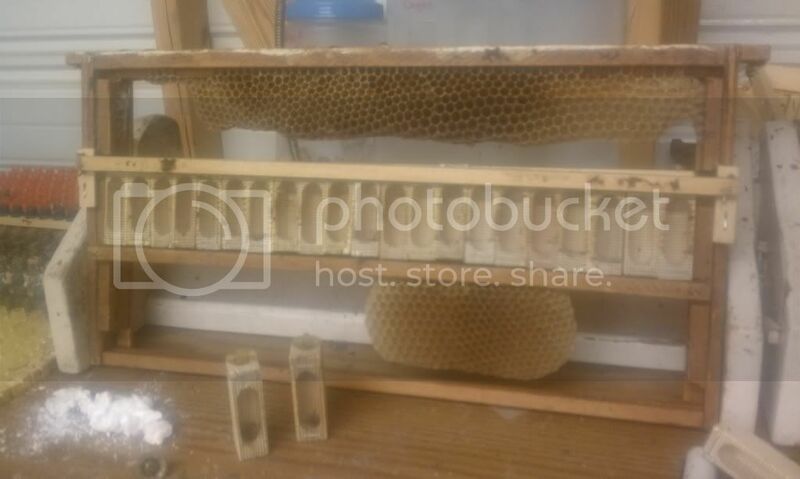 I'm thinking a good accessory might be another queenless nuc just like it, but instead of using it to start cells, just swap out the brood frames every week, keep it over fed, and shake bees out of it into the actual starter finisher when it's time to graft. >So letting them lay within the mating nuc for three weeks AFTER they have mated, correct? Let them lay uninterrupted. It doesn't matter if it's the nuc or the hive they will end up in, but they are best if they aren't caged or banked before at least three weeks of laying. They are better at 2 than at 1. A typical commercial queen gets caged as soon as they see eggs. A few places go longer, like Russel. I do not recommend returning the starters to a queen-right condition until after you are certain that you have all of the queens that you want... remember that there are many variables that will come into play here... you may get a perfect take on your graft and every cell may hatch perfectly, but then the queens get eaten by birds while trying to mate... This is the chaos factor of queen rearing... if it can go wrong, it will... 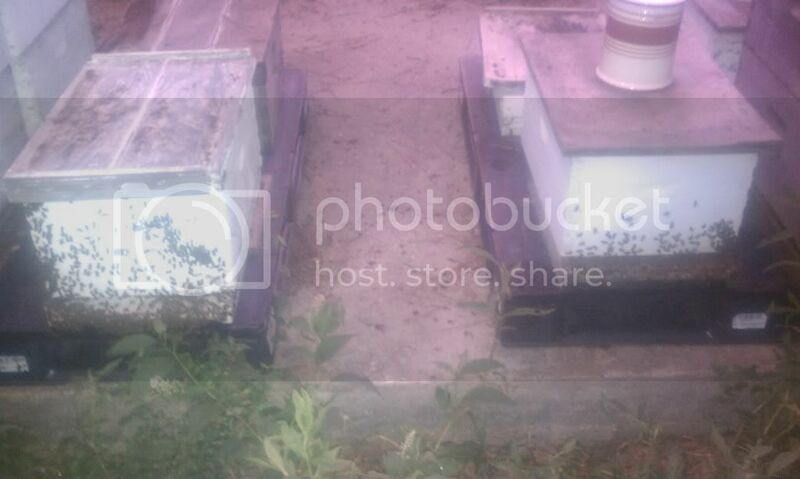 So tomorrow's posts will be geared more towards being prepared for the unforeseen, as well as setting up mating nucs in a way that keeps you from having to get new equipment and keeps you from having to use up your bee resources...""""""""""""
Returning to your original question, did you move the open brood up and the capped brood down in your finisher? Nice posts Robert. I especially like that summer starter idea, how long do you keep using that starter? Yes I did. And I even used the sunkist hive as the finisher, lol. On a side note, what's the last date that you would recommend someone in central NC graft? I was thinking about doing one last batch (I ordered some Royal Jelly off your site today, as well as some pollen substitute from Brushy Mountain) but I'm afraid I wouldn't have enough time to provide proper nutrition, graft, start, finish, and mate all the queens as well as giving them enough time to get a few cycles of brood out in order to overwinter. I wouldn't be concerned about starting now if I was going to re-queen with them, but i was hoping to let them start their own 5 frame nuc. I'm going to spend the rest of the day sitting down and thoroughly reading this thread again, and then hopefully I'll compile a day-by-day analysis of what I should be doing. Day 4 – Graft 12-24 hour-old larvae into cell cups (primed with a drop of royal jelly). Spring: make up a five frame queen-less nuc, with two frames of un-capped honey and two frames of pollen. Add pollen substitute (if needed) and a wet sponge. Pack in four pounds of nurse bees. Add grafts and let sit overnight. Summer: Add grafts to a queen-less full hive, which contains no open brood. Add a feeder and pollen substitute if needed. Day 5 – Check your grafts: the bees should have started to draw out the cells and feed the larvae with royal jelly. If not, re-graft. 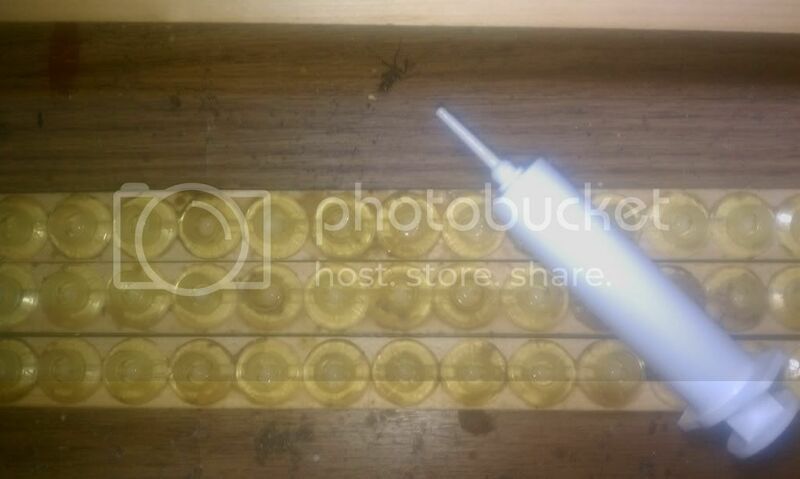 Move grafts into a cell finisher (full hive with capped brood and queen on bottom under a queen excluder). Add 1:1 sw and ps if needed. Day 8 – Cull all cells that are capped (too early), those that are not 100% filled with RJ, or are mis-shapen or small. It's pretty good. Only I'd add a few more days for the mating flights. How do I know that? There can be solid rain on those two days, and they'll still mate. Lol, I thought I'd get called out on that. I know the flights occur on more than those days. It's more like an approximation. It's what was on that on-line calendar and I didn't feel like typing "Potential Mating Flights" about 6 more times. But hey, in the interests of completeness, I'll go back and change it. The important point is that you discard un-hatched cells on day 18, then don't touch them until the 37th. It's good to keep in mind that they are flying more than just two days though. 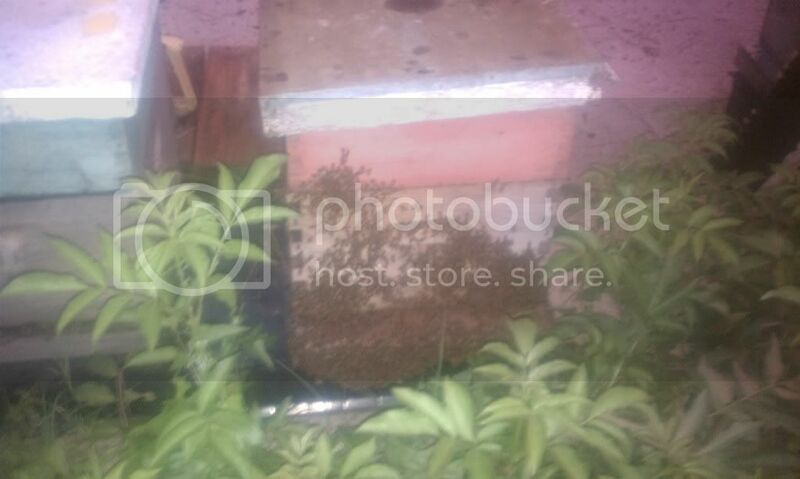 So the preparation of the hives, the nutrition, and the feeding all look good? Looks pretty good... the only thing that I would say is that you may find the bees moving a bit ahead of your schedule during the summer, so again, stay flexible... also, set up you mating nucs strong enough to keep them going if a cell doesn't hatch... like I said, I try not to disturb them for the full cycle, so my nucs have to be strong enough to miss a turn every once in a while... due to high heat, I usually hatch virgins in a hatchery frame, then plant virgins that I have physically inspected.... they are planted in the same California mini cages that they were hatched in... leave them caged for a day, then pull the cell and let them walk out... after that, I don't touch them until its time to cage... the mini cages that are used to hatch them are impregnated with the pheromones from the hatchery... so acceptance is really good... I have sent you a few gifts, so you can try this out for yourself to see if it works for you. Ps, what is the reason for feeding hbh? Last edited by rrussell6870; 08-16-2011 at 06:57 PM. It's important to remember that beekeeping is more of an art than a science. My professors always told me, we write all these books about bees, but they never read them. They don't always follow the books. Keeping that in mind, I'm planning on staying VERY flexible, and responding more to the needs of the situation than necessarily my "schedule." But what parts do you see varying, for example? The mating nucs are by far the hardest part for me at the moment (other than great nutrition to create amazing cells). Too small and they ignore the cell, too large and they may swarm. It's something that I need alot more work on, but I'm sure I'll get it down after a few cycles. Next summer, I plan on keeping the mating nucs going throughout the spring, and every three weeks (or so) putting in a new cell. This time around, though, I only think I'll be able to get one more batch of queens out before I need to give them time to produce populations necessary to overwinter. I plan on using this batch of queens to make overwinter nucs from, not to re-queen with. I don't think I'm familiar with a hatchery. I'm familiar with an incubator, and a queen banking frame, but not a hatchery. Can you explain it a little? Once again, thank you so much for all of the help and guidance. By the way, how's that book of yours coming along? Mr. Bush ended up publishing his . . . no pressure or anything, lol. Great posts everyone. I have been off the forum for a few days, so trying to catch up. I am in the same boat as Specialkayme. I completed two grafts off of a Russell SKC breeder. I should have tought ahead and ordered some royal jelly with the breeder from Robert. I am kicking around the idea of grafting one more time, but I am also concerned with the up coming fall in the mountains of north Georgia. I wanted to use the daughters off of the breeder to head up my drone hives next spring. Keep the info coming. I'm all ears. Oh yeah, I want to nail down the process of "great" queens by the time I introduce my Moon Beam stock next year. I hope it will be the icing on the cake to my genetic structure. A hatchery frame is simlpy a queen bank that has openings large enough for ripe cells to fit into them. The cells are placed into the cages and the frame is placed into a queenless hive that has been pumped full of open honey and fresh pollen... the queens can be taken when they are needed, but do not leave them more than a few days... the sooner they get into nucs, the better. 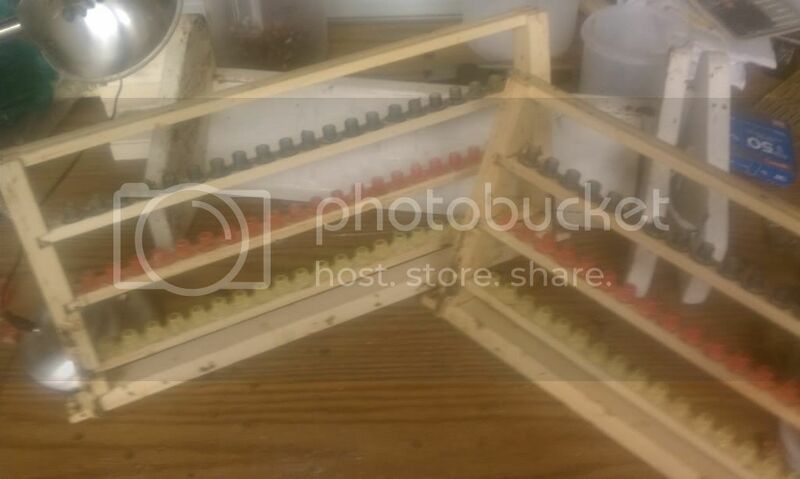 Here is a pic of one that uses california mini cages... it will hold up to 42 cells/queens... very simple to make using a standard frame, piece of 1/4" plywood, and a few divided bottom bars... sure, it could be made much more sturdy, but I honestly prefer them to be as flimsy as possible because it FORCES my staff members to be extra gentle... which is a great skill for any bee keeper to master. lol. Lol, that's actually what I thought a hatchery was. I can see how important they would be to a larger producer, or if you were attempting to select queens for a visual characteristic like size or color, but how useful are they for the small producer? Or is their use more beneficial in getting mating nucs to accept a virgin queen, rather than a cell? Yes, actually. It helps alot. I'll read up about hatcheries a bit more, and plan on using them next year. Thanks yet again! Next summer, I plan on keeping the mating nucs going throughout the spring, and every three weeks (or so) putting in a new cell. That's exactly what I've done this year, but I've come to the conclusion that the ones that fail to make a queen need all new frames of brood before the next try - at least after the hive beetles get cranking. Just a few too many days of queenlessness, and they can go from being alright to melting down. The hatchery frame would also prevent what happened to my last batch of cells - an early bloomer killed the lot of them, and left me with the quandry of finding a virgin in a crowded hive or letting her have it. I chose B.